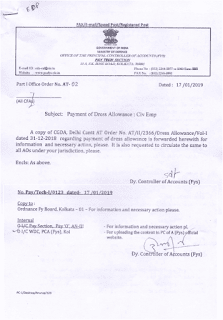 (a) While dealing with the grant of Dress Allowance in terms of DoPT OM dated 31.08.2017 and to ascertain the categories of employees to whom the dress was supplied prior to the implementation of 7th CPC, a certificate. which includes all conditions prior to the implementation of 7th CPC, a certificate. which includes all conditions mentioned in DoPT OM dated 31.08.2017, may be obtained from the claimant unit alongwith the bills. 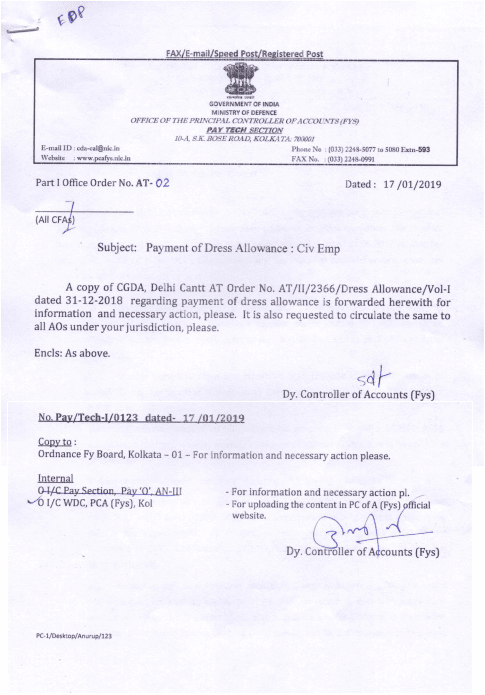 (b) Regarding the Dress Allowance to MES/AOC employees to whom Dangri is issued and were granted ‘washing allowance’ of Rs. 24/- per month, E-in-C branch has been approached vide this HQrs letter 25.10.2018 to provide a list of Uniforms duly classified as Basic Uniform and Special Clothing being provided to MES Employees. In response, HQ MES. vide their lette- B/20943/LIV/GEN/EIC(2)/53 dated 22 Nov 2018, has intimated that a case has been taken up with MoD regarding grant of Dress Allowance to Industrial Personnel of MES and decision/ sanction is awaited (copy enclosed). However, as regards to Gp ‘C’ and Gp D staff of MES. it has been intimated that various items of liveries were being provided to them has been stopped and they are entitled for Dress Allowance as per DOPT OM No. 14/4/2005-JCA-2 dated 31 Auc 2017. Therefore, the Dress Allowance to MES personnel may be regulated in accordance with HQ MES ibid letter. This issues with the approval of Jt CGDA(P&W). .
Delhi Cantt - 110010 .